With Windows XP, you could set your own login background colors and/or wallpaper by modifying the values found in the following registry location: [HKEY_USERS\.DEFAULT\Control Panel\Desktop]. Windows 7 no longer reads this registry key. Instead you’ve got to complete the multi-step process described in this article. While the steps to set a login wallpaper are not complicated, one challenging limitation is the fact your background wallpaper needs to reside on the workstation’s hard drive. Interestingly, this is not true for the user’s wallpaper, as there are GPO settings to point to a network location. So when I had a customer ask me to set their login wallpaper, I had to think of how I wanted to accomplish their request. We could possibly write a script, and as much “fun” as that might be, I’d rather use something more controlled. Something that would allow me to easily change the configuration later as well as be decipherable to the customer after I leave. The answer? 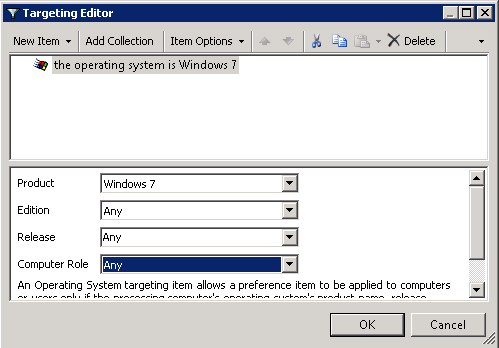 Group Policy – Preferences, that is! So before we jump in to the Group Policy Management Console (GPMC), let’s identify what we’re trying to do. If you haven’t already, you may wish to read the above link, otherwise you’re about to be lost. Copy our wallpaper file to the user’s workstation. Instruct Windows to use our file instead of the default %WinDir%\System32\oobe\background.bmp file. 4. Type in the UNC path for your source file. •Also understand the permissions on this share need to allow the workstation’s computer account READ. If you leave the usual “Authenticated Users” you’ll be fine. 8. 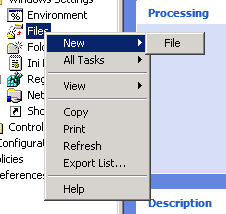 Optionally: Select Item-level targeting to specify only Windows 7 computers. This will ensure your file isn’t sent to versions of Windows that wouldn’t make use of it anyway. Now we need to instruct Windows to render this image when the login screen is displayed. If you read the above article, you’ll remember the OEMBackground registry key. The good news is, we don’t need that key because there is actually a setting to enable it in GPMC already. Once there, select “Always use custom logon background” and set it to “Enabled”. This has the same effect of setting the registry manually. 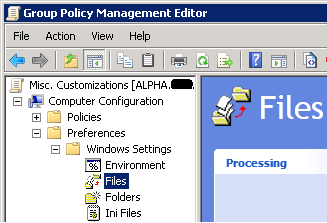 Once you’ve completed these steps, close the Group Policy Management Editor and link your policy to an OU – you’re done! This policy may take two refresh cycles (e.g. reboots) to take effect. This is because the wallpaper file is not yet present when the “always use custom logon background” setting is first applied. But once the file has completed copying you’ll see your image at logon. If you would like to consider multiple screen resolutions, please consult this link. Before we close, I should point out, this can work for Server 2008 R2 as well. I have not tested with Vista or Server 2008. Now I might be crazy, but I cannot find the “Always use custom logon background” as a part of a GPO I created on my Windows 2008 R2 DC. I have found it on the local GPO on a Windows 7 PC. Is it something I’m missing or should I see that missing policy on my DC? Check that it was a GPO issue on my network. A fellow admin configured a central store of Policy Definitions and never updated with the R2 admx files. After I did that I had the setting and it is working great. Good Find! Glad you got it working. I have a question about a default theme, i have logged to a laptop -pre domain and i have saved a custom theme file ( screensaver installed, aero colour and taskbar colour etc) yet, when i choose ‘ Force theme’ it doesn’t work,! i have tried to put it in the resources folder, in a shared folder, in a server folder. I think i know why this isn’t working, I’m using a Server 2008 STD machine, and lots of these rely on the 2008 R2 ADMX files… i can manage them from my win7 enterprise sp1 box. In Group Policy I first had to create a new folder before “%windir%\system32\oobe\info\backgrounds” before this would work. This is because the folder does not exist by default, and the file creation policy will not create the folder, and thus it will not insert the image file. Interesting and thanks for the share. I’m not sure why that would be. I did not have to do that in my testing or production rollout. Wow, this is great. I’m used to just getting Free Desktop Wallpaper by browsing through the net. Thanks for this post, it has stimulated my desire to try it by myself as well. Any way to make this work on Sever 2003? You’d like your server logon wallpapers to be customized? If so, I believe you can edit the registry location I mentioned in the first paragraph. If you’re asking about setting this value for Windows 7 workstations, while you are using Windows 2003-based domain controllers – yes. But you’d need to create the GPO itself from a Windows 7 computer running RSAT. 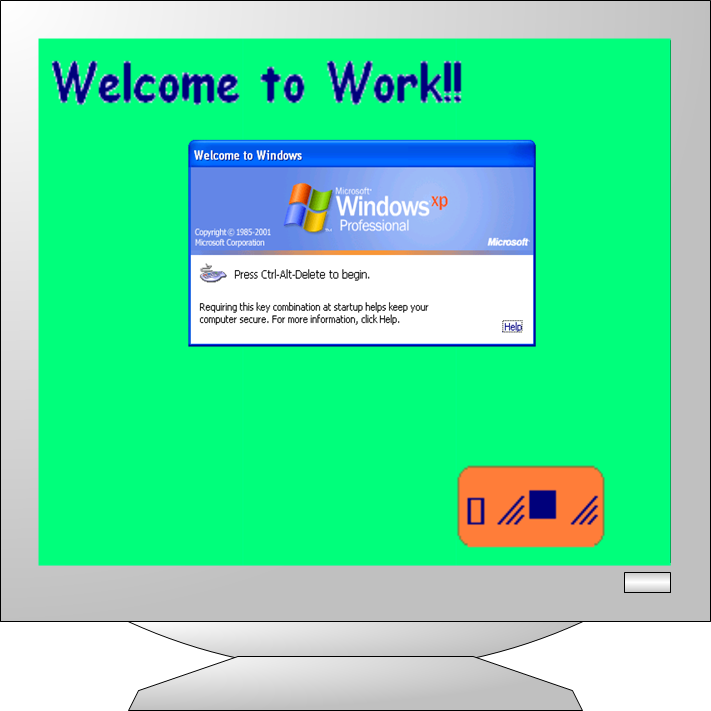 I want to set the Windows 7 workstations logon wallpaper using Windows 2003 server. Do you have an article about creating the GPO? Hi Mike, first of all thanks for you help. 1) I see you are copying the new background file from a network server, but I am also doing it and it does not work. The file server is in the same domain and the user has access. Could be this because Computer Configuration applies before the user log on so there is no domain services? 2) Do you know if your procedure works with x64? Raul, the file share needs to allow the *computer account*, not the user. Any of you experts know how to get the logon background on a remote desktop connection for windows 2008 R2? I’ve been banging my head for days. The logon background is there for local logon. I messed with the Remote Session Environment in gpedit.msc and disabled “enforce removal of remote desktop wallpaper” and enabled “always show desktop on connection” and still, a plain green screen appears. Any suggestions would be GREATLY appreciated. Thanks. Thanks for such an amazing instruction! Pingback: Deploying Desktop Backgrounds - What's the best method? I cant find the “always use custom logon background” in windows server 2008wSP2 in default domain poilcy. do i have to upgrade to 2008R2wSP1? You don’t have to upgrade, but perhaps use Win7 RSAT so you can see the new template. OK, but the environment is about 200 Windows 7 professional desktops. WIll win 7RSAT give me all the features that R2 has especially concerning compatibility with windows 7 workstations and the mutiple policies I have to put in place? Is there any way to setup a GPO that will allow a wallpaper shuffle? or allow user to pick a wallpaper from approved list? We have four approved wallpapers. I can push out one wallpaper and users can see the other three put gpo is restricting them from picking another. Any help is greatly appreciated. 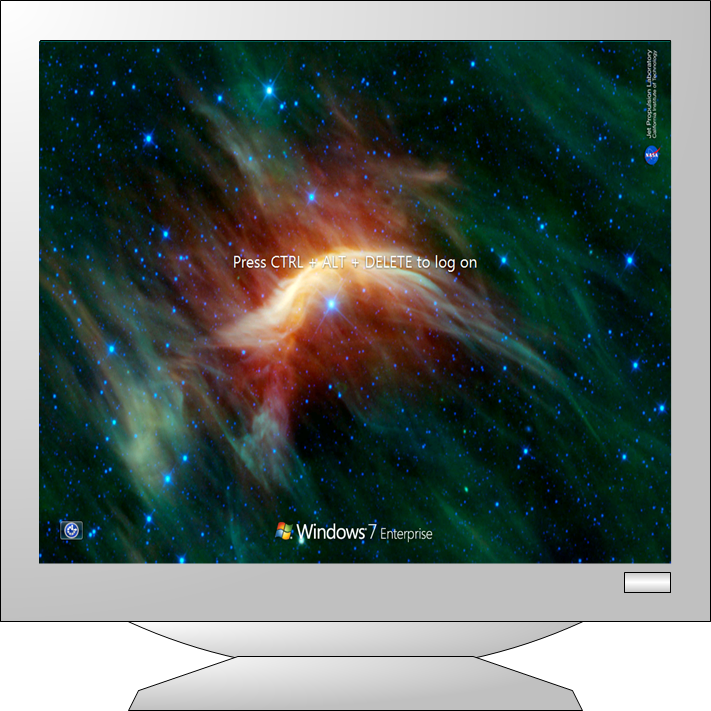 This post is about the “wallpaper” applied behind the ctrl+alt+del screen. Short of frequently deploying new settings, no, there is no mechanism to rotate the image. If you’re talking about once the user logs in, yes, there is a lot of documentation on building “theme” files and deploying them to your users. and it will works for all stations. I just found your article while searching for a fairly easy way to standardize the logon screens across our enterprise (many of the HP machines we’ve purchased in the past had HP-themed logon screens while others had the standard Windows 7 one). This was easy to configure and it works like a champ. Thank you for this!